?Leashed dogs are allowed on this trail, but it might be a challenging hike for your canine hiking buddy. Check out our favorite dog-friendly trails near Asheville for a great hike with your pup. Grandfather Mountain’s imposing ridgeline rises high from North Carolina’s mountainous landscape, carving high into the sky along a spine of four towering mountain peaks. It’s one of the most prominent, easily recognizable views from the Blue Ridge Parkway, and dominates the horizon on the Appalachian Trail at Roan Mountain. Some adventures at this well-loved North Carolina State Park carry the price of park admission, like the famous ‘Mile High Swinging Bridge‘. But one of our favorite hikes at Grandfather Mountain summits the mountain via a fee-free access trail, the Profile Trail. It’s a challenging hike, without a doubt. But it’s an incredibly rewarding one, scoring incredible views of the mountain’s face-like outline at Profile View, ascending through a rocky, wildflower and hardwood-filled forest, and scrambling over a boulder-filled fir forest to exceptional views. The trail summits Calloway Peak, the highest mountain on the Grandfather ridge. The views are outstanding. The forest is scenic. And the trail is exceptionally well-designed and built, making for a fun, though challenging, hike. It’s easily one of our favorite hikes near Boone, Banner Elk and Blowing Rock – and one of our all-time favorites in western North Carolina. Up for the adventure? Hike carefully and watch the weather: Grandfather Mountain is known to host quickly-changing, severe weather, so be prepared to leave the backcountry quickly and safely if harsh weather rolls in. The adventure begins at a parking area and trailhead, located off Highway 105 south of Boone (view maps and driving directions). While the parking and trail access is free, permits are required, and available at the trailhead’s shelter. 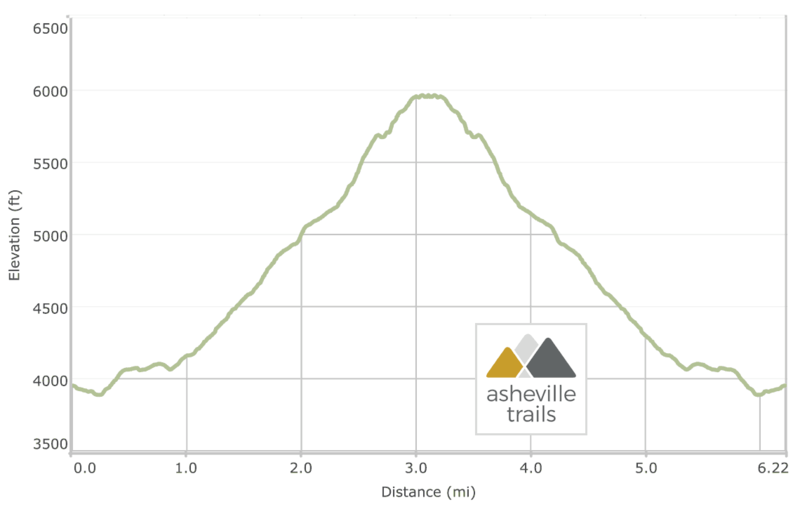 The hike dives into a shady, hardwood forest alongside the Watauga River, following orange diamond trail blazes. The trail crosses the clear, shallow river by stepping stones, following the river downstream and crossing a small tributary. Gnarly-branched rhododendron line the river’s banks, a colorful display of blooms in late spring. The trail carves through switchbacks at .25 mile, arcing eastbound away from the river and climbing above the river valley. The trail rolls elevation, meandering through a deciduous forest of hardwoods, vibrant green ferns, and wildflowers. The trail passes a group of towering rock outcrops at .85 mile. The hike’s ascent resumes, following the trail through broad switchbacks to reach Foscoe View at just under 1.7 miles. The views from Foscoe View span over the forested valley to the adjacent North Carolina peaks of Snake Mountain, Elk Knob, and The Peak, and onward to Virginia’s highest peak, Mount Rogers. It’s a beautiful view, but the best views are further up Grandfather Mountain’s summit. Passing Foscoe View, the trail continues its nearly unrelenting climb of Grandfather’s middle elevations, carving through tight switchbacks. The trail passes the Profile Campsite at just under 2 miles, exiting the switchbacks and climbing beside sharp, angular rock outcrops. 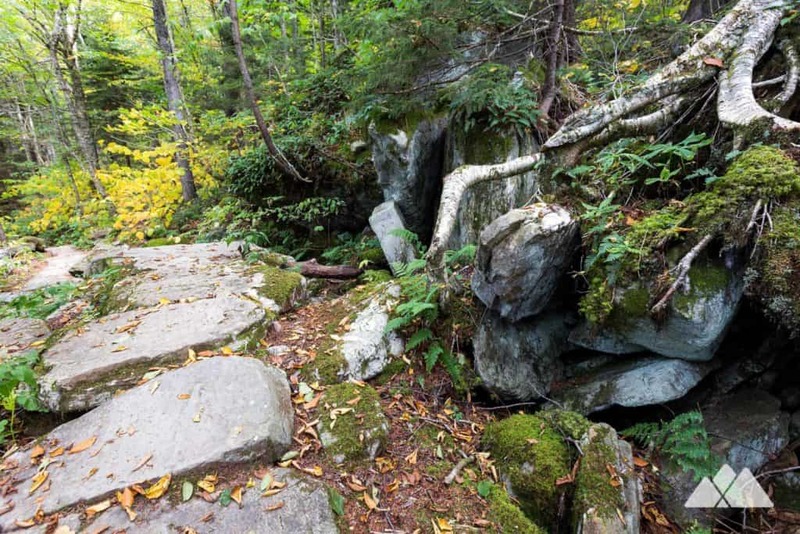 Stone stairs and wide, level stepping stones navigate through the rocky, moss-covered terrain – one of the best examples of technical trail building we’ve encountered in the South. The trail passes a towering, fractured rock outcrop and a deep cave, switching back to reach Profile View at just over 2 miles. 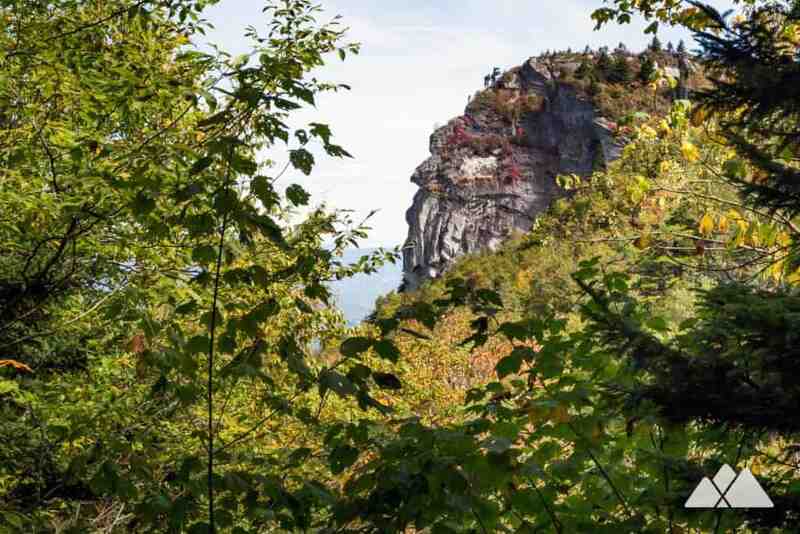 Grandfather’s famed face-like outline is visible from the overlook, a sinister-looking, jagged outcrop visible through the trees. From the spring, the trail begins a rocky, rooty, uphill adventure, making a climb over a boulder-filled trail through stands of fragrant fir. The climb is relatively short (just under .3 mile), intense (over large boulders and loose rocks) and challenging (it’s easy to lose your footing on the rocky terrain). Our group, including our trail-savvy Labrador Retriever, made the ascent slowly and carefully, but without any issues. The hike reaches the Grandfather Trail at Calloway Gap, and the hike turns left at the gap, following the Grandfather Trail .4 mile northeast to Calloway Peak. The Grandfather Trail climbs through rocky, wind-swept, high-elevation terrain, dominated by Canadian fir. The hike passes the Grandfather Trail’s 2-mile marker before passing the Cliffside Campsite on trail right. A left turn leads to a rocky, sun-drenched overlook at Watauga View (above photo). The views are exceptional, expanding far onto the horizon, and the blocky rock outcrops make for a great mid-hike resting place to refuel with a snack. 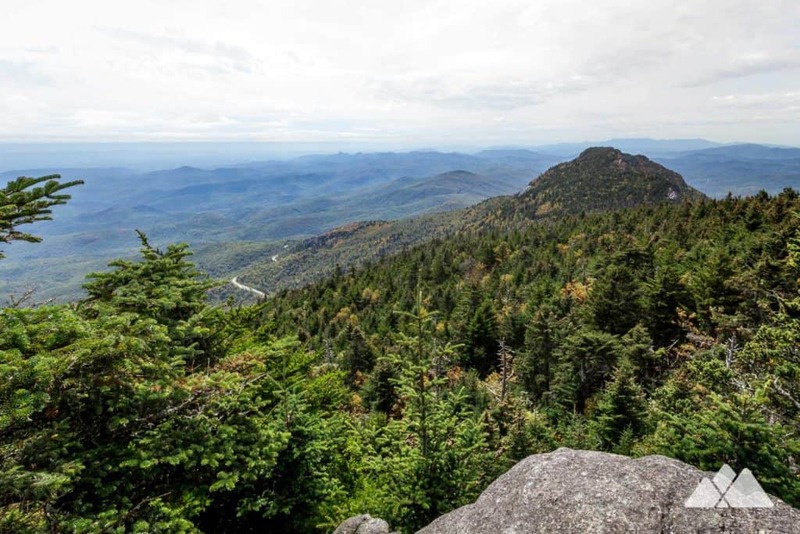 Calloway Peak is the highest of the four summits along the Grandfather Mountain ridge, offering incredible views over the rolling fir forests, down the spine of Grandfather’s ridge, down to the Blue Ridge Parkway and out onto the horizon. 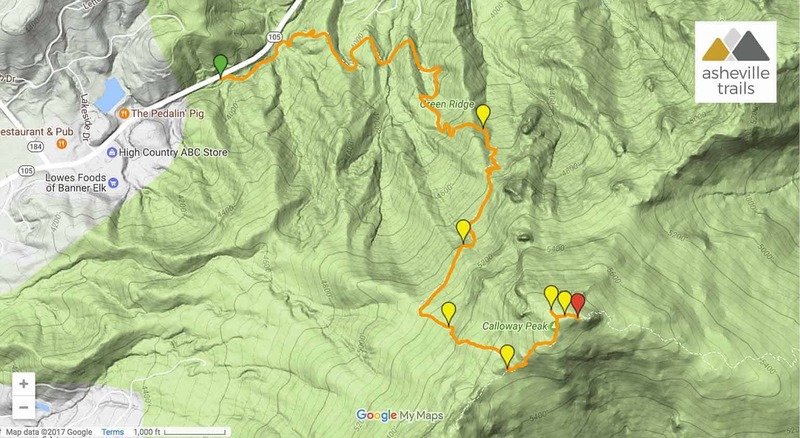 Departing the peak, this out-and-back hike retraces its outbound steps, following the Grandfather Trail to Calloway Gap, and turning right at the gap, following orange trail blazes to the trailhead. The hike dips back into the stream-filled hardwood forest, reaching the trailhead at just over 6.2 miles and completing the adventure. In the area with energy and daylight left to burn? Hike a short one miler at Rough Ridge, located just off the Blue Ridge Parkway, to stunning views on a rocky, rugged summit. 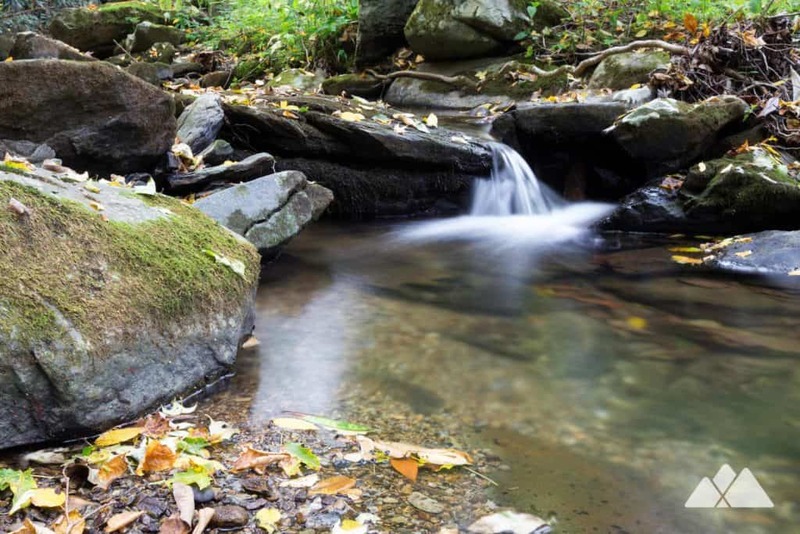 The hike follows the Tanawha Trail through incredibly beautiful, fragile terrain and catches incredible views of Grandfather Mountain and the Linn Cove Viaduct. This trail is maintained thanks to the hard work of countless volunteers and donations from supporters of the Friends of High Country State Parks. Please support them by making a donation or joining a volunteer day. Let's work together to keep these fantastic trails maintained and open for use! Free parking is available at the trailhead. Permit required (free; fill out the provided form at the trailhead).